First comes Stories, then comes Snap Maps — Snapchat is continuing its push for new users by opening up select options to live outside the app on the web. On Monday, February 12, Snapchat launched the Snap Map URL that allows web browsers to access a map of Snapchat Stories. Unlike most social networks that have both an app and a dot-com access point, Snapchat was entirely app-based until the company launched Stories Everywhere in January. The feature allows Snapchat’s stream of short video clips or photos to be shared on the web through a link. 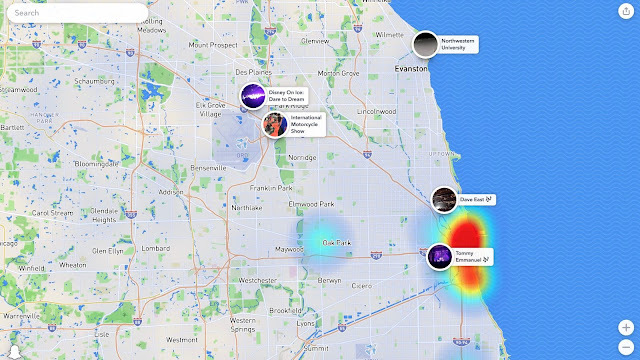 Now, Snapchat is applying the same idea to the Snap Map. Now, visiting map.snapchat.com allows access to the geotagged Stories previously only accessible from the mobile app. Using the map, users can find Snaps shared nearby, or use a location to follow an event, like New York Fashion Week or the Olympics, or a travel destination. Like in the app, the map shows hotspots by color coding where the most Snaps are coming from. Clicking on one of those hotspots will automatically play the Stories one after another.